EurekaLog stores configuration in .eof files. .eof file is a UTF-8 encoded text ini-file, which can be edited in any text editor, or in specialized Settings Editor tool, included with EurekaLog. Additionally, you may manually create individual configurations for each profile (each build configuration). For example: Project1_Debug.eof. See Different EurekaLog settings for Debug and Release profiles for more information. Note: you may create additional (external) configurations. Any .eof-file different from base or profile configuration is considered to be external configuration. Default folder for saving external .eof files (i.e. folder for "Import configuration" and "Export configuration" dialogs) is %AppData%\Neos Eureka S.r.l\EurekaLog\Profiles\ (e.g. like C:\Users\UserName\AppData\Roaming\Neos Eureka S.r.l\EurekaLog\Profiles\). Any .eof file placed in that location will appear as "custom" project type. 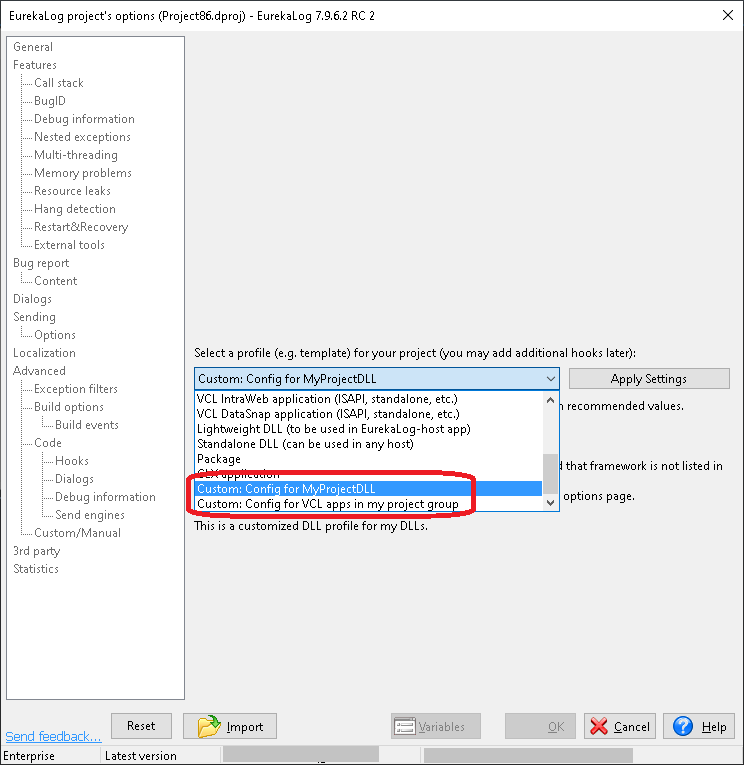 .eof files outside of the above mentioned folder will not appear in "Project type" option. For example, base configuration of your project will never appear as custom profile. Apart from %AppData%\Neos Eureka S.r.l\EurekaLog\Profiles\ folder, a typical places to store external .eof files are folder or sub-folder of your project. When you open such file in modern EurekaLog version - old options will be imported, saved into usual .eof file, and erased (technically, not erased: EurekaLog will simply not bother to save/write into project options file, and IDE will eventually overwrite non-standard blocks). You still can store settings in such files manually, and you can use Settings Editor tool to force-save settings into these files.